Building Code Requirements for Structural Concrete (ACI 318M-08). This concrete code was already implemented in CYPECAD, Metal 3D and in other CYPE structural programs. 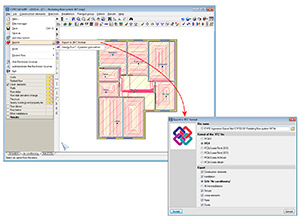 Now, in the 2013.m version, if users select the ACI 318M-08 code and combine it with the NBDS 2006 Bolivian seismic code, CYPECAD’s Advanced beam editor and column editor may also be used. Additionally, by using this code combination, CYPECAD applies the ductility reinforcement criteria of the Bolivian NBDS 2006 code to the seismic design of concrete beams and columns. 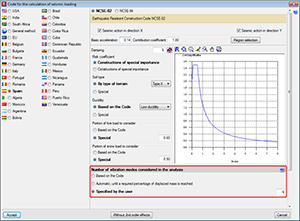 Now, in the 2013.m version, if users select the NTE E.060: 2009 code with its corresponding seismic design code (Norma Técnica E.030), CYPECAD’s Advanced beam editor and column editor may also be used. Additionally, by using this code combination, CYPECAD applies the ductility reinforcement criteria and capacity design criteria of the NTE E.060: 2009 code to the seismic design of concrete beams and columns. Norma Boliviana de Diseño Sísmico (2006). Título A. Análisis y diseño sismo resistente. This concrete code was already implemented in CYPECAD and Metal 3D. Now, in the 2013.m version, if users select the Bolivian NBDS 2006 seismic code with the ACI 318M-08 concrete code, CYPECAD’s Advanced beam editor and column editor may also be used. Additionally, by using this code combination, CYPECAD applies the ductility reinforcement criteria of the Bolivian NBDS 2006 seismic code to the design of concrete beams and columns. 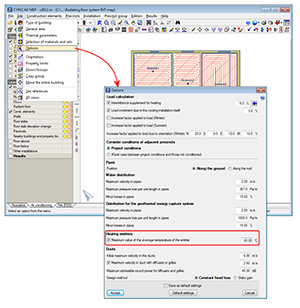 Now, in the 2013.m version, if users select the NTE E.030 code with its corresponding concrete design code (NTE E.060: 2009), CYPECAD’s Advanced beam editor and column editor may also be used. Additionally, by using this code combination, CYPECAD applies the ductility reinforcement criteria and capacity design criteria of the NTE E.060: 2009 code to the seismic design of concrete beams and columns. On the 13th April 2013, several article modifications of the Reglamento de Instalaciones Térmicas en los Edificios (RITE) were published in number 89 (I. DISPOSICIONES GENERALES, MINISTRO DE LA PRESIDENCIA), Royal Decree 238/2013, of the 5th April, of the Spanish Official State Bulletin (BOE). As of the 2013.m version, CYPECAD MEP incorporates the modifications that are indicated in the Royal Decree in its calculations and results. Amongst these modifications are the new classification of external air quality and its filter classes, changes carried out on the minimum insulation thicknesses of the piping that transports cold fluids, and the new table indicating the minimum insulation thicknesses for refrigerant pipes. Implemented in the Electricity tab (for those countries for which it is available) of CYPECAD MEP for jobs created for Brazil, to check the lighting in precincts. Implemented in the Electricity tab (for those countries for which it is available) of CYPECAD MEP for jobs created for Brazil, to design earthing electodes. The 2013.m version of CYPE programs incorporates the generic export to IFC4 format (Industry Foundation Classes) in CYPECAD and CYPECAD MEP. This way, CYPE programs have become the first engineering and construction software to export to IFC format with the specifications of the new definitive version: IFC4 (previously known as IFC 2x4). As Revit, Archicad and Allplan gradually incorporate reading of the IFC4 format in their software, CYPECAD and CYPECAD MEP will incorporate specific exports to these programs in IFC4 format. The analysis is carried out in accordance with that specified in the selected seismic code. This section may not exist if the selected seismic code does not specify this data. Users define the minimum percentage of accumulated modal mass that is required to be displaced in each direction. Users indicate the number of vibration modes based on their own judgement. Until now, this was how the number of vibration modes was indicated for the seismic analysis, where users had to choose the value bearing in mind the requirements of the selected code, the structure to be analysed and/or their own considerations. More information on the seismic design criteria for concrete columns and beams applied by CYPECAD with these two design codes can be found in the section on Improvements in code application (Concrete code and Loads on structures. Seismic loads) on this webpage. The quantity export to Arquimedes of rectangular columns, shear walls and footings is carried out in a detailed manner and in such a way that the three dimensions of these elements are included. 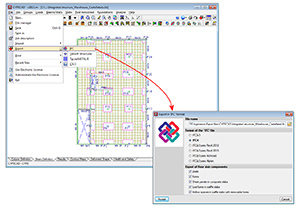 The 2013.m version of CYPE programs incorporates the generic export to IFC4 format (Industry Foundation Classes) in CYPECAD and CYPECAD MEP. More information on this new feature can be found in the Export to IFC4 format from CYPECAD and CYPECAD MEP section on this webpage. A new option has been implemented in the 2013.m version, to limit the maximum value of the average temperature of the emitter for heating emitters, to a value chosen by users (Air conditioning > Job > Options > Heating emitters). For CYPECAD MEP jobs that have been created for Spain, this option is activated by default with a value of 60ºC, so to comply with article 9, which has recently been added to the RITE (IT 1.2.4.1.2.1 Requisitos mínimos de rendimientos energéticos de los generadores de calor). For all other countries for which the Air conditioning tab is available, the option is deactivated by default, and is left to the user’s criteria as to whether it should be activated and the value that is to be introduced. The geothermal heat pumps of the geothermal energy harvesting systems, of the Geothermal energy harvesting systems module (recently implemented in the 2013.k version) can now be exported to IFC format. The indicated equipment and systems are exported to IFC format (Industry Foundation Classes) in accordance with the standards of the format. Additionally, the elements are assigned appropriately to the IFC entity and materials and colours are included with the export. The export to IFC format of Air conditioners (Air conditioning tab > Installation > Air handling units) has been improved. This equipment could already be exported to IFC format (Industry Foundation Classes) as of previous versions, in accordance with the standards of the format. Now, for the 2013.m version, the elements are assigned appropriately to the IFC entity and materials and colours are included with the export. The export to IFC format has been improved for the following water conduction systems components (Air conditioning tab > Installation > Water handling systems): Valves, Circulation pumps, Manifolds, Water counter for heating. These elements could already be exported to IFC format (Industry Foundation Classes) as of previous versions, in accordance with the standards of the format. Now, for the 2013.m version, the elements are assigned appropriately to the IFC entity and materials and colours are included with the export. As of previous versions, users could link quantity tables or subtables belonging to the same price structure. As of the 2013.m version, one or several columns can be unlinked between the linked tables. To do so, the option: Unlink this column from the reference, has been implemented and is contained in the contextual menu that appears on-screen upon clicking on the cell belonging to the header line of the reference and the column to be unlinked. This option has to be executed at the table at which the column to be unlinked is located, as it may occur that there may be more than two job units that have the same reference, and the user only wishes to unlink the column corresponding to one of the job units with linked tables. This new option allows for the possibility of having two tables that are identical to one another except the contents of one (or more) of its columns. As of previous versions, users can select the type of subtable to create from a list of subtable models included with the program. Amongst these models are the "Weight of IPE type steel sections", "Weight of IPN type steel sections", "Weight of IPN type steel sections", "Weight of HEB type steel sections", etc. These subtables include a formula that calculates the weight of the section based on the data, provided by users, in the table (Depth in millimetres, Length in metres and Number of sections). 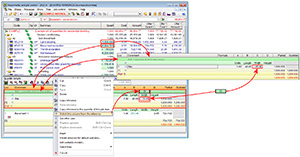 Arquimedes checks that the depth of the sections that have been introduced by users coincides with a standard value located within the internal tables of the program. Before the 2013.m version, if the depth did not coincide, the program rejected the value that had been introduced leaving the Depth column empty. As of the 2013.m version, if the value does not coincide with that contained in the table, the program displays the corresponding section table, so users can select the section to be used.